You are here: Home / Gardening / How to Propagate Basil – For Pennies! How to Propagate Basil – For Pennies! I have a Basil at home and I want to know how you did it but I can’t see your instruction… All I can see is the picture but this is absolutely awesome I’m gonna try on mine…. Thanks for sharing this! If you click on the link at the top of the post it will take you to the directions. I’ve had great success growing Basil indoors! Along with just about any other herb you can imagine. But my Basil is the most beautiful! My dining room has a large south facing bay window that is my ‘Forest’ of herb and veggie plants. My living room has a matching window where I used to winter my container tomatoes and pepper plants.. now I have a chaise there, so no more plants. That may change next winter, I have been missing my tomatoes tooooo much! My DH teased me about my ‘Basil Tree’, I kept it pruned but after 6 years it actually developed a wooden trunk and wooden branches. After a good pruning it was at least 3 feet high. I was very sad when I accidentally killed my tree. I always have several basil plants but none as prolific as my ‘tree’. I use fresh herbs in almost everything. Thank you for sharing this propagating method, I have never heard of it, but I can’t wait to get started! I can’t wait to explore the rest of your site! That is amazing! You definitely have a super green thumb. We always grow a lot of basil in the spring/summer, but you’re inspiring me to start a winter indoor garden in our sunroom. Way to go! Thank you for sharing. I am hoping to get my cuttings that I harvested just before our frost the other night to root. How well does basil do wintering indoors in a pot? Also, have you had any luck with rosemary. Mine always withers. Hi Aida, Thanks so much for your kind words. I really appreciate you taking the time to write. 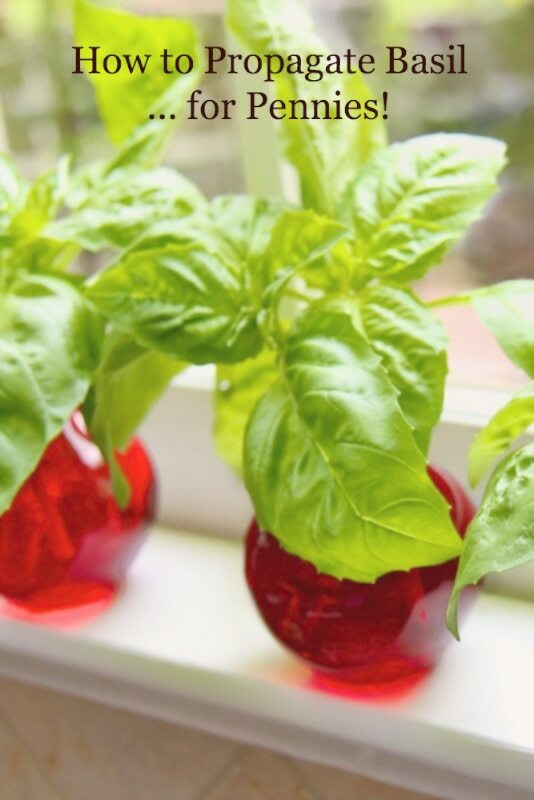 You can grow the basil in water but it won’t last as long as it would in soil. I bought a basil plant and did as the instructions said…but I left it in the dirt it came in! I have a sunny window in the morning, but the rest of the day is not…would this still work if I cut as you suggest, and either keep them in water, or replant them, in dirt, indoors? Hi Kayla, I think it should be okay as long as you have a few hours of good sunshine and bright light for the rest of the day. The cuttings will last in water for several weeks but then will get weak. In dirt they will grow better and keep longer. PS from MaryAnn Coy if you preserve Basil in oil, you must refrigerate it. It will keep I – 2 YEARS. In the back of your fridge. When you go to use it, you will find the oil solid and white. Just measure it out into a dish an hour or so before you need it. Cover if you have a cat. The combination is Kitty Nervana but only a couple of licks or Kitty will get overweight . To the Lady who asked about leaves in her jelly. I think it will work if your water bath canning. But the place to check would be the Ball Company website If that doesn’t work Google Ball company, canning, pre serving. That site had an Q and A area. They have an 800 number but I’m not sure if it’s on site or not. Good luck. MikasMom. Thanks for sharing this simple method. I tried root powder last year and it was really sad how the cuttings all just wilted and died. This looks so much easier. Thank you! As we head into fall, do you have any thoughts about using this method with bail from the garden to get us through the winter? I honestly haven’t tried bring the plants in for the winter months. Let me know if you try it! CHRIS, I TRULY HAVE A GRREN THUMB AND THIS IS RIGHT UP MY ALLEY. I MADE BASIL JELLY AND MINT JELLY THIS YEAR FOR THE FIRST TIME. NEXT SUMMER I PLAN TO PLACE A SMALL LEAF OF BASIL AND OF MINT IN EACH JAR. THAT WAY IT WILL NOT REQUIRE A LABEL AND MUCH EASIER TO DISTINGUISH. WILL THE FRSH LEAF IN EACH JAR BE HARMFUL IN ANY WAY? I WOULD HATE TO POISON ANY ONE THAT I SHARE THE JELLIES WITH. I LOVE ALL THE REPLIES TO YOUR MOST HELPFUL INSTRUCTIONS I FOUND ON PINTEREST. BEAUTIFUL PHOTOGRAPHS AND EASY INSTRUCTIONS. THANK YOU AGAIN. You can root cuttings from the garden. Like plants from the nursery, look over very carefully for signs of insects or disease. You don’t want to bring in anything that might spread to Houseplants. If frost is in the forecast,pick everything you can and bring it in, store in a cool place and save it. I read earlier in another blog, about preserving basil with Olive Oil and salt. Use a clean empty jar, layer some olive oil, sprinkle of salt and a hand of basil leaves,press leaves down and make sure basil leaves are covered by the oil. Repeat this layering and pressing until the jar is full top with just enough oil to cover. Cove tightly and put as much as you feel you can use in soups, casseroles and use the flavored oil as a salad dressing staple. If you have freezer space make pesto ahead and freeze meal size portions. I used to make at least 25 every Summer and by the time they were gone the row in the garden was ready. Lastly save some in water in the fall as Chris reccomends. I usually use from the bottom when I’m chopping and pinch the tops for salads and garnish. Pinching the tips helps it stay bushy. When it gets leggy at the bottom, I cut the stems up to just below a leaf node. The process will begin again, you can keep it going indefinitely. I have bought bouquets of Basil at the herb section or farmers market and cut an inch off the stems and followed Chris’s procedure. It works well if you can’t find a plant. This method also will work for other types of basil, like Thai Basil or lemon basil. The seeds can be hard to find, and nurseries generally charge $3.00 – $4.00 per plant. So buy only enough plants to get started for the amount you use then trim them in Chris’s fashion. Leave a few base leaves and plant the base plants in your garden. They will grow back thicker than ever and you can harvest frequently right up to frost. Bring what you have in and preserve it the same way, plus a vase for the window. You can do everything the same with red or purple Basil or any kind of Basil.. I’m thinking of trying this with some other herbs I use a lot like parsley and cilantro. Even if they don’t resprout, they might keep for a longer time than they do in the fridge. I will remember to mist them a little each day and retrim the stems, if they are right in front of me. Chris, I apologize for kidnapping your blog profusely. When I get on a subject I love or have history with, I get carried away. I miss my community garden plots and my families farm, where there was always scads of Basil planted. I’m so happy to be reminded of how to preserve Basil both ways and wanted to share that this would work with the more expensive specialty Basils. Thai is used frequently in many Southeast Asian cultures, and can be added to any dish you thing it would taste good in. However it is always used fresh in the restaurants and both plants and seed are expensive. I have only found dry online. So please forgive my long post. I will truly try to practice brevity in the future. I love this site and love basil. I would love to know where you got those cute red containers? Hi Beckie, those little vases came from Crate and Barrel a few years ago, not sure they still have them. Maybe online ? In Spain we can do it outside in sunny places. I also love basil a lot. Great post with clear pictures…..have to do it! This really is simple, I’m off to the store to get a basil plant now. Do you recommend using rooting powder and just put the cuttings straight into a pot or the ground? Hi Loreto, I’ve never tried that so I can really advise you. I’d be afraid they’d wilt too much before they developed a strong root system. If you try it, let me know. I found this tip on Pinterest and guess where I am right now? That’s right, just about to do a little snippety-snip-snip to my lone basil plant which is still indoors. Love this idea. Great tips! Thanks so much for sharing. Can you tell me why you remove the two bigger leaves in picture #3 (right above where you cut it? I remove the leaves for two reasons. First because they will start rotting and will make the water kind of nasty and second because that’s the area where the roots will start forming the best and removing the leaves seems to help the process. Great idea! We love fresh basil here too. I’ll be picking up a basil plant to do this soon!